Not long ago, our choice of electric cars were rather limited but those days are behind us. Automakers have taken up the electric cause and, regardless of their motivations (or, in some cases, lack thereof – looking at you, Ford! ), EV enthusiasts should be pleased at the growing list of options on offer. Well, guess who’s throwing their flamboyant hat into the mix? None other than Italian automaker and Chrysler chaperone, Fiat. 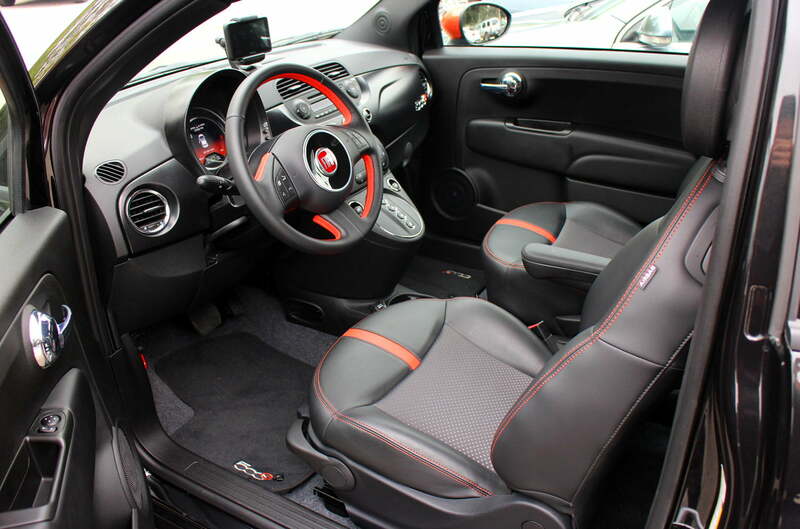 Slotting alongside the likes of the Nissan Leaf, Ford Focus Electric, Mitsubishi i, Tesla Model S, Honda Fit EV, Toyota RAV4 EV, Chevy Spark EV, and the Coda Electric (yes, even the Coda Electric) comes the 2013 Fiat 500e. Based on the excellent Fiat 500, the 500e looks to entice buyers with the same squirrely driving dynamics and fashion fetish the Italian brand is known for, while at the same time forgoing the Devil’s sweat that is gasoline and attempting to address all the concerns inherent to an electrified vehicle: limited range, prohibitive sticker price, and stymied performance. While the majority of the 500e’s tech overhaul is found under the hood, the interior sports a number of enhancements over the standard model that helps aid in its electric endeavors. 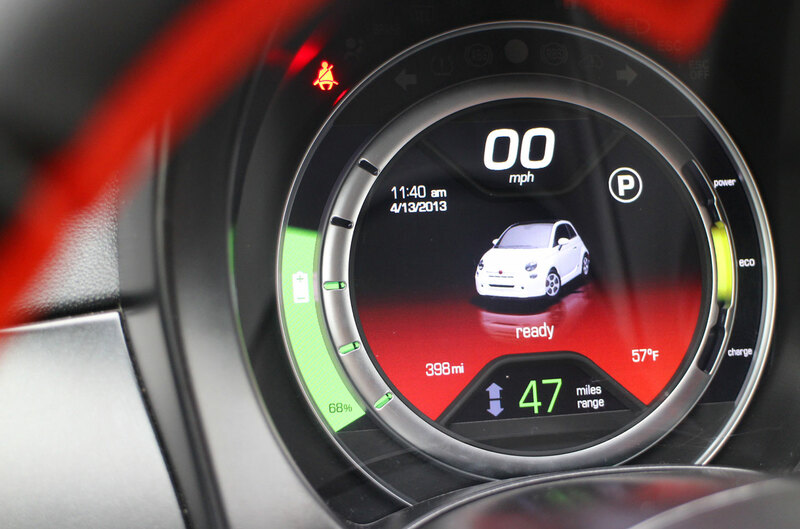 Gone is the standard gauge cluster, replaced by a new 7-inch, circular, thin-film, transistor (TFT) display. In addition to the standard mph display, the TFT display showed me virtually everything I needed to know regarding the electric drivetrain. One of my biggest complaints with EVs is how daunting it can be to figure out how much range I have left and what my battery state is. The 500e addresses some of those issues with a number of common sense design choices. On the left there’s a battery gauge showing how much battery I have and what that range is. The center of the display shows what my current mph is, and the right side of the cluster shows how my current driving affects the battery. This is separated into three categories (power, eco, and charge) along the illuminated band. 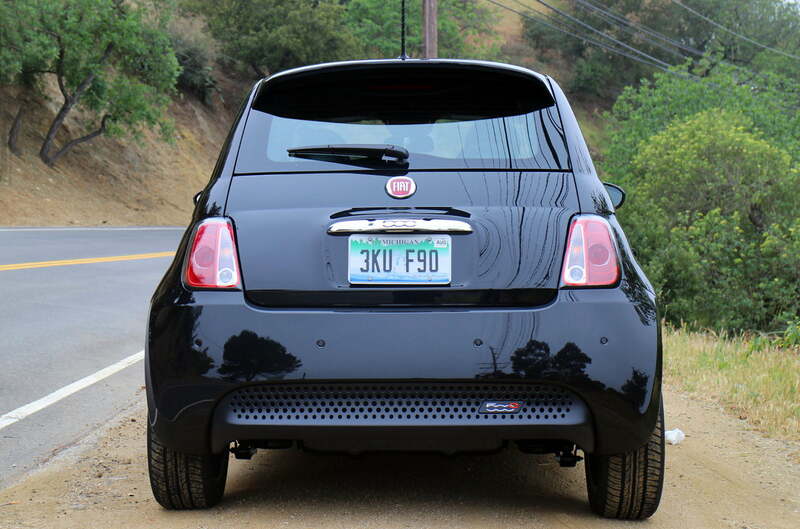 Fiat gives the 500e its own impressive voice with a retro-futuristic design. Because the 500e doesn’t have a dedicated “ECO mode“, the display on the right was very helpful to see how my current driving was affecting the onboard battery. When the band is in the power section it meant my heavy foot was taking its toll on the battery – and therefore my range – eco mode is akin to how Miss Daisy would want to be driven, while charge indicates that the regenerative braking is charging the battery (more on regenerative braking in a bit). The 500e also does away with the standard shifter in favor of push buttons for Park, Reverse, Neutral, and Drive. Not everyone will like this but it makes some sense in an EV. 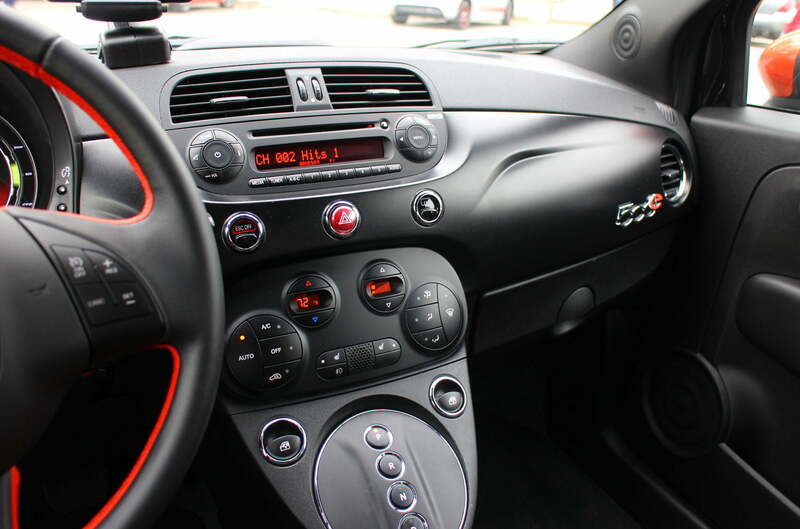 Finally, the 500e sports a Tom Tom-based navigation system that sits atop the vehicles dash. 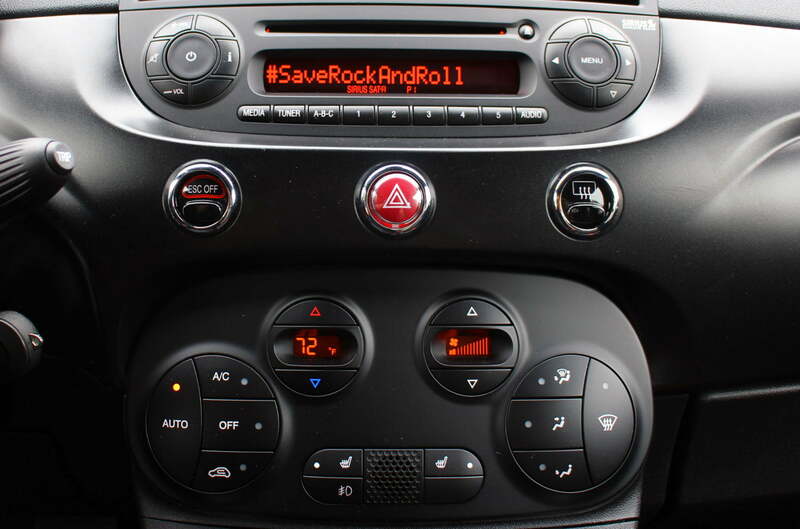 Truth be told it’s not the most elegant solution – especially for a brand so dedicated to aesthetics – but it would appear Fiat designers had no other choice, due to the diminutive size of the dashboard. 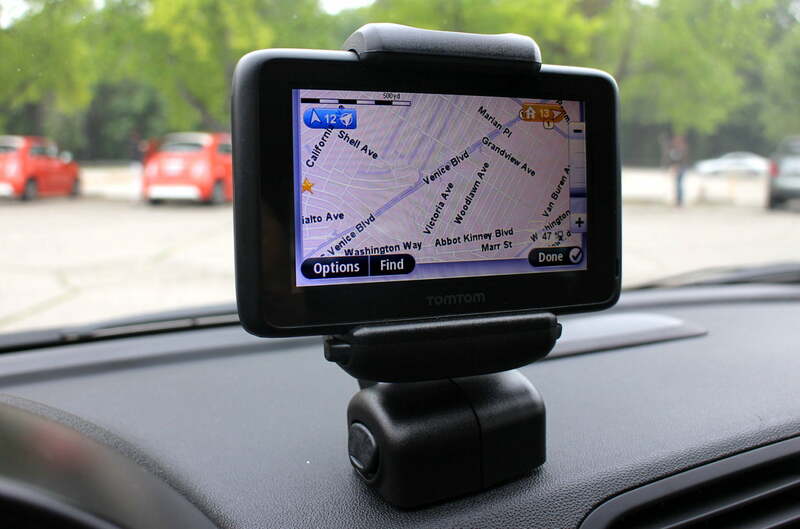 While the navigation system functions just fine, we’re not so thrilled by its placement. Not only does it look like an afterthought, it limits visibility while driving. Surely a better solution exists? Funky and fresh is the best way to describe the 500e’s interior. Again, there isn’t much derivation from the non-electric models, but Fiat gives the 500e its own impressive voice with a retro-futuristic design. 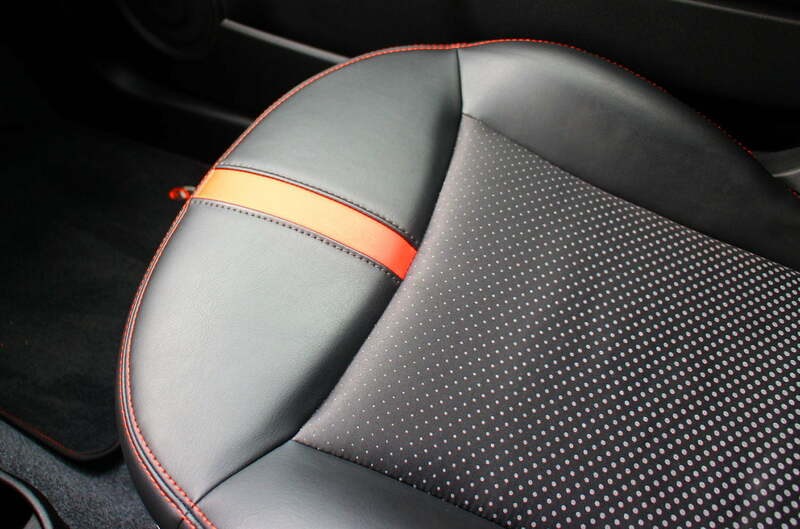 Two new interior color schemes are offered for the 500e: Steam (white) interior with Arancio Electrico (orange) accents, and a “murdered out” Nero (black) option that feature the same orange accents on both the seats and three-spoke steering wheel. Another thing worth mentioning is the headroom offered up front. Unless I’ve shrunk some since reviewing the Fiat 500 last month, it seems like there is a small (but noticeable) increase in headroom. 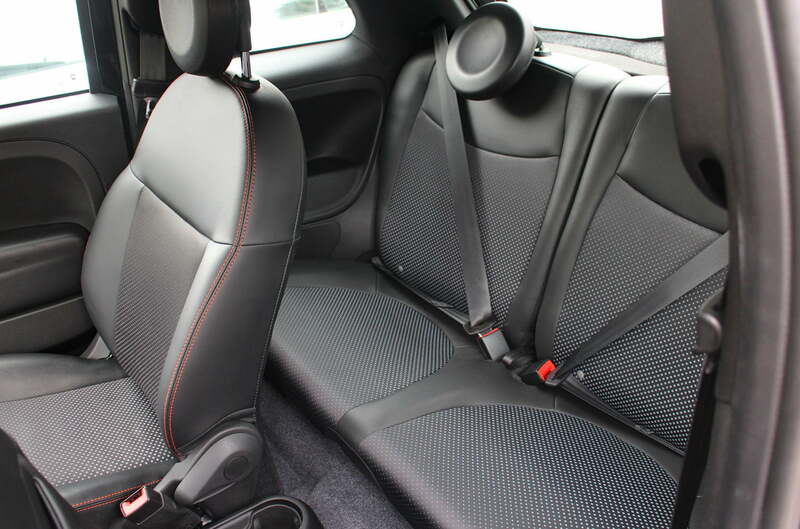 The backseats, as before, are better left to very short people, but Fiat designers did mention that because of the placement of the 500e’s lithium-ion battery underneath the floor panel, that rear seat legroom has increased ever so slightly – but I couldn’t tell. There aren’t many dead giveaways to distinguish the 500e from its gasoline counterpart but that doesn’t mean the signs aren’t there. In addition to 500e badging and a new “dot-matrix” front and rear fascia, which is a lot easier to spot when mixed with the Bianca Perla accents (white pearl), the 500e sports streamlined exterior mirror caps, under vehicle bellypans, and a liftgate-mounted spoiler. On top of looking “bellissima,” all of the 500e’s unique exterior design elements help reduce the 500e’s coefficient of drag by 13 percent over the standard 500, according to Fiat. Of course the fashionable accents doesn’t stop there. 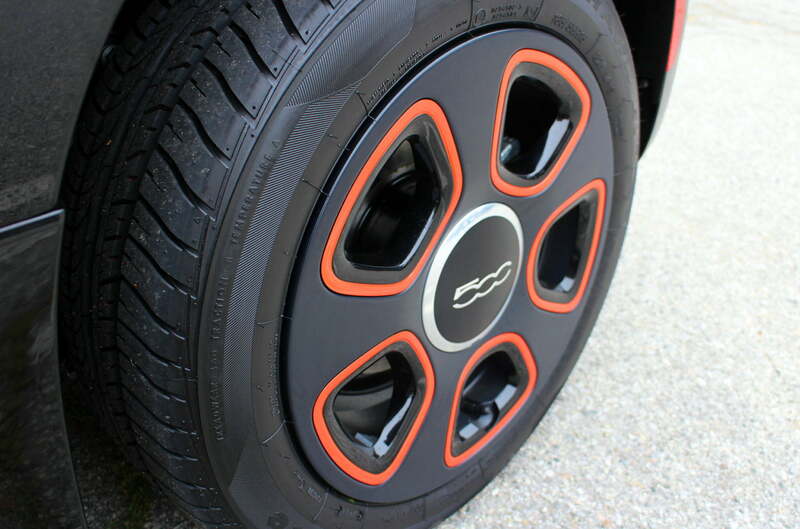 Fiat went to great lengths to instill the 500e with style and flair (oh how we love the Italians) and in doing so offer an even more stylized “high-voltage” eSport package which includes blacked out 15-inch rims complete with orange inserts, orange mirror caps, and electric orange side-detailing, with Fiat’s designers citing the recent Tron Legacy light cycles as inspiration. Riding on electricity alone, the little Italian Stallion features an 83-kilowatt (111 horsepower and 147 pound-feet of torque) electric motor powered by a 24 kilowatt-hour lithium-ion battery pack. Fiat says the 500e will travel 87 miles on a single charge with an EPA rating of 122 MPGe worth of city driving. EPA figures also award the 500e with a 108 MPGe rating on the highway and 116 MPGe combined city and highway driving. Additional range is supplemented by the 500e’s regenerative braking system that captures kinetic energy created during braking and converts it to electricity for the lithium-ion battery. The whole system interfaces with a regenerative braking controller (RBC) that takes the driver’s brake-pedal input and determines the total amount of brake power requested. Depending on input levels (how hard you press down on the brake), the RBC is able to adjust the level of friction and regenerative braking instantly. Now, a lot of drivers complain that regenerative braking systems can feel too intrusive, because letting off the accelerator even slightly causes instant vehicle kickback, which essentially amounts to “one pedal braking.” The Mitsubishi I springs to mind in this respect, but I don’t particularly mind it. Still, if you prefer the feel to be more “behind the scenes” you’ll appreciate the Fiat 500e’s as it goes virtually unnoticed. Battery packs have a tendency to become temperamental in adverse weather conditions but the 500e combats this issue by employing a thermal management system. It’s a little complicated but essentially the system supplements the vehicles passive cooling (done through the 500e’s brazed aluminum radiator) by circulating a blend of chemicals to help ensure optimal cell-to-cell temperatures. The electrification process has added roughly 640 pounds to the vehicle and while noticeable, actually adds to the vehicles driving dynamics. The thermal management system is rather interesting because it maintains optimal operating temperatures, which in turn help maximize range and recharge times. 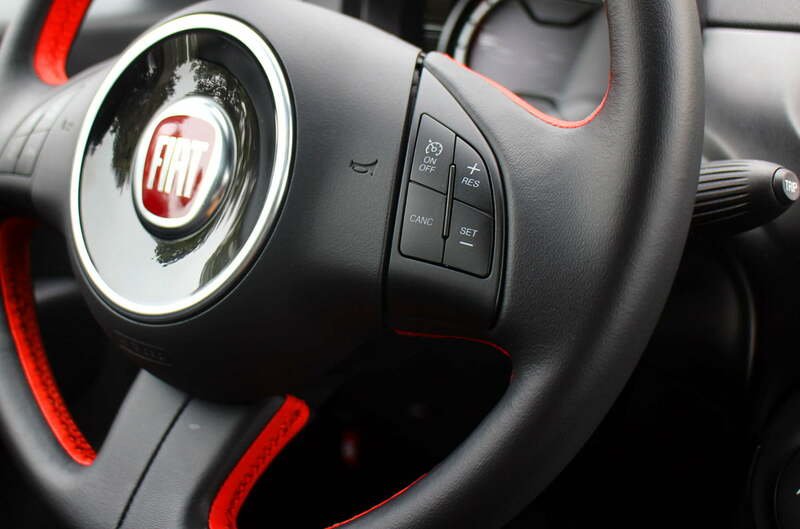 Because of this, Fiat says drivers can expect to retain about 80 percent of battery life over 10 years of ownership. Though, the 500e does come with an eight year 100,000 mile battery warranty to help assuage any fears. I didn’t get a chance to charge the 500e myself, but Fiat says recharge times for a 120-volt Level 1 charger will take about 24 hours on a fully depleted battery while a 240-Volt Level 2 will get the job done in four. 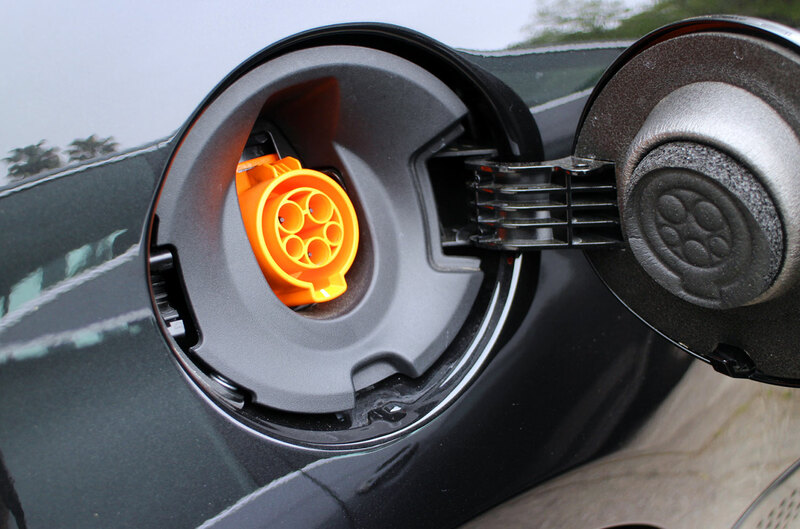 Currently the 500e does not support 30-minute Level 3 fast-charging but company reps were quick to point out that such future versions could be compatible once the technology becomes more widespread. So how does it drive? Like some ancient Roman Caesar overlooking the coliseum, I give the 500e resounding thumbs up. The car handles magnificently and is every bit as tossable as the gasoline version. Despite its front-wheel drive configuration, the 500e almost behaves like a rear-wheel drive car. The added weight from the electric drivetrain is flung pleasantly to the rear during hard cornering, a credit to the vehicles’ 57/43 front-to-rear weight distribution, and proves more animated than two mobsters arguing over which of their mother’s tomato sauce is better. Fuhgeddabout it? I will not. Because the 500e is gearless, that 147 lb-ft of torque I mentioned earlier is practically instant, meaning mashing the petal dumps it all at your disposal, providing a grin that’ll easily stretch from Milan to Sicily. A major downside to all the spirited driving the 500e warrants is the toll it will take on your range. And because I drove the 500e on some of the windiest roads California’s Pacific Coast Highway’s has to offer I think it’s safe assume that the tradeoff is worth it. While most will confine the 500e to urban sprawls and concrete jungles, the truth is the electric Fiat is every bit as capable outside most EVs “normal” stomping grounds so long as you don’t venture too far from charging station. 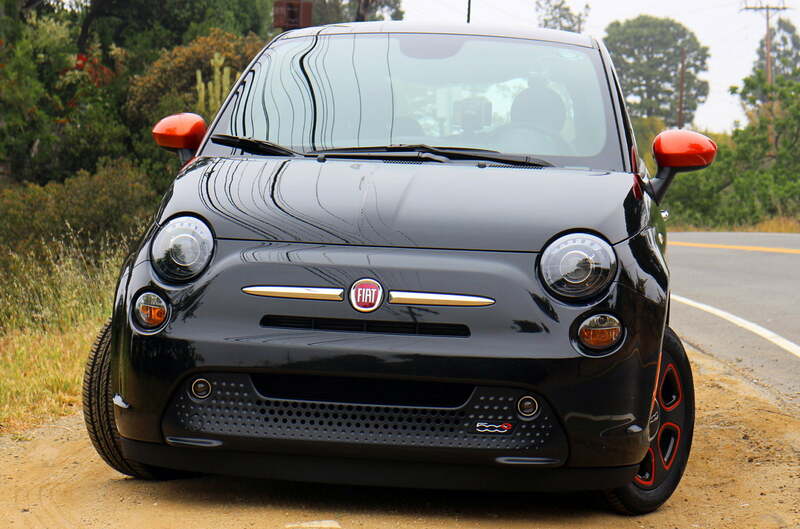 What truly sets the Fiat 500e apart from other EVs is its ability to avoid the overwhelming generalization that electric cars are boring to drive. Like the Fit EV before it, the 500e provides the sort of spirited driving you’d expect from a “normal” car. If anything, Fiat has shown that EVs no longer have to be the organics of the automotive world; we know they’re good for us but they’re almost always more expensive. At least with the 500e, it’s legitimately fun to drive and there are tangible rewards for buying one other than some environmental feel-good factor. 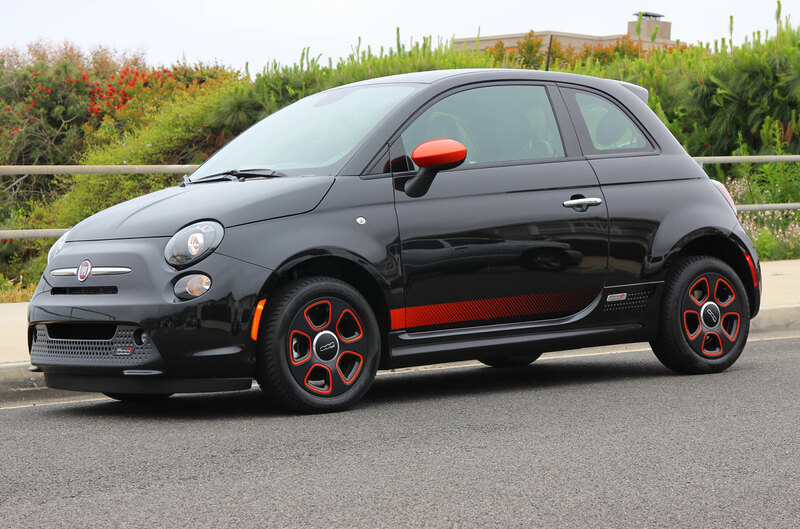 The 2013 Fiat 500e is one of those cars I really want to hate – not because it’s a bad car by any means, but because it does so much right that it makes my job seem embarrassingly elementary. My only real quarrels with the car stem from its limited availability and its price point. Right now, the 500e is limited to California only – so anyone outside the Golden State interested in the car just had their parade rained on. 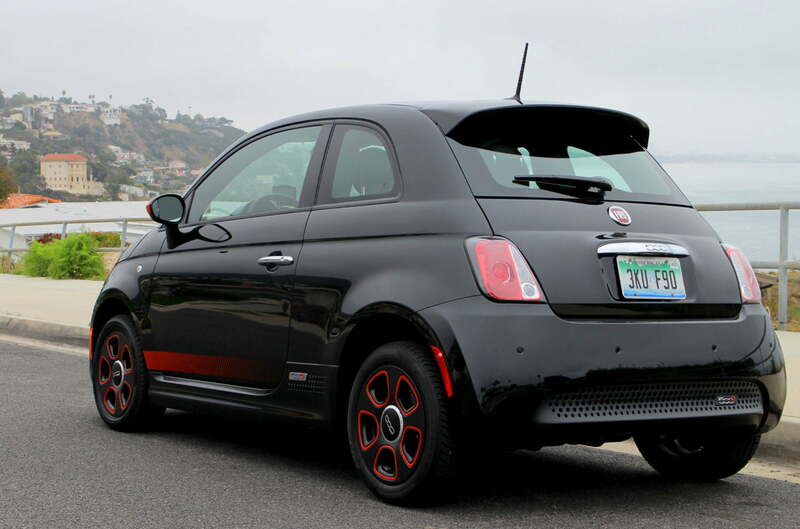 Fiat’s CEO Sergio Marchionne has been surprisingly candid with his valuation that the 500e is little more than a compliance car meant to adhere to California’s increasingly stringent CAFE standards so it’s unlikely we’ll be seeing it elsewhere – though not impossible. 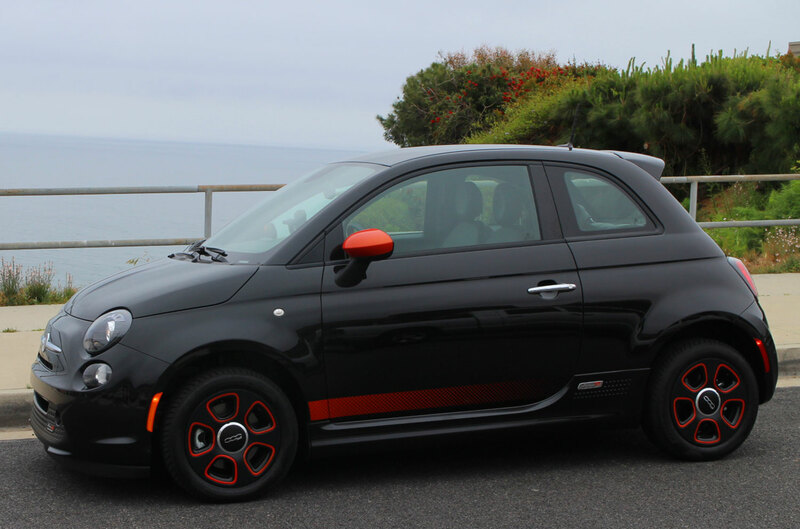 At $32,500 it’s twice as much as the standard Fiat 500 but it does include a number of rebates including a $2,000 rebate from Fiat, a federal tax credit of $7,500, and an additional $2,500 tax credit from the state of California. Thankfully, the 500e is kitted out with everything you’d find in a top of the line 500 Lounge version but despite all that, the 500e is still relegated to being a niche purchase and will likely remain that way.